Having previously interfaced a Game Boy camera to an AVR (Ardweeny / ATmega328P) and successfully capturing an image, the next step in detecting a candle flame was, well, detecting the candle flame. Would the camera be able to capture an image of a distant flame? Would an IR filter work to block out everything but a source of flame? For that matter, the flame detection software hadn't been tried on an actual Game Boy image yet. And the code hadn't been ported to the memory-constrained AVR yet either. Using exposed film as an IR filter I got good image results for a distant candle, below, sitting about 170cm from the lens, a typical distance in the real competition. The candle flame is left of center. The center bright spot is the candle's reflection in a glass-covered picture hanging on the wall (but, in the competition, mirrors cannot be placed in the same room as the candle). I added a feature to the client software allowing me to save the captured picture to a file on the PC. Then I processed it into a BMP that my prototype flame detection program could read, and the program it spit out the data for the real candle. It worked! The flame detection software would have to run on the robot so I redesigned the code to fit into the tiny 2K of RAM on the ATmega328P. Recall that the software essentially performs a flood fill on every pixel brighter than a set threshold. 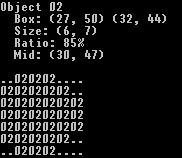 Since it's only purpose is to spit out a set of bounding boxes around detected objects, it really doesn't need to remember the entire image or the flood fills (assignment of pixels to objects) already performed, just the object assignment for the current and prior rows' pixels, from which it can calculate the bounding boxes. 01 01 01 01 01 .. .. 02 02 .. .. 03 .. It turns out that we never need to look more than one row above, so we only need to keep two rows of object assignments. That's an array of 2 rows, and (in the case of the Game Boy camera) 128 columns. With the added bonus that we can use a simple XOR operation to toggle back and forth between the two rows: the first time through, row 0 is current, row 1 is previous and the next time through, row 1 is current, row 0 is previous. Here's the excerpted AVR C code that does the "flood fill". For what it's worth all the camera and object detection code is just over 4K in size so there's no reason it wouldn't fit in a lower-end AVR. Detection worked well even without the IR filter. 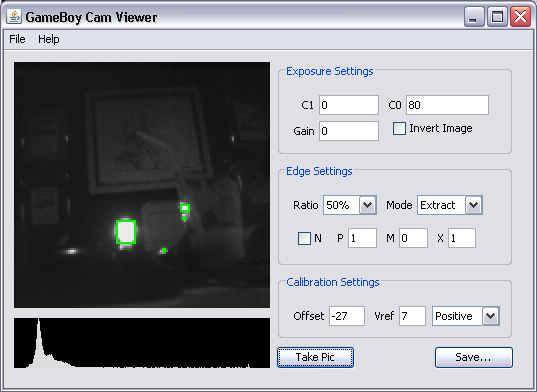 With the filter, object detection will probably be more reliable. You'll notice some extraneous objects detected. One is the candle's reflection in a glass holding the remains of an iced latte I made. The other is... a reflection off the computer mouse, I think? Of what, I don't know. The vision-based detection has come along really nicely. It's pretty darned close to usable right now. Without too much more work, I could hook up Pokey's Orangutan controller to the Ardweeny and it could request and retrieve detected objects and then do something with them. One of the concepts in iterative development is to focus on solving the hard problems first and leave refinement and easy features for later. I think that makes a lot of sense so I'm going to put the flame detection on the back burner and work on fixing Pokey's navigation problems. But you won't hear about that for awhile. Instead, the next few articles will share the steps involved in proving out how to equip Pokey with a Bluetooth modem. READ=D8, XCK=D9, XRST=D10, LOAD=D11, SIN=12, START=13. The analog VOUT goes to A3. I added this documentation to the top of the pde file. @anonymous - sure, but Arduino will be very slow in taking and saving the picture. The result is that any movement of the camera during taking/saving the picture would blur the image.